Hey everyone. You might have noticed that in the last period, new information was scarce. So I decided to make something new: a game review. You know how much I like Battlebots (and tanks), so this game was appealing to me from the first minute. What it is about? You build your robot and fight. 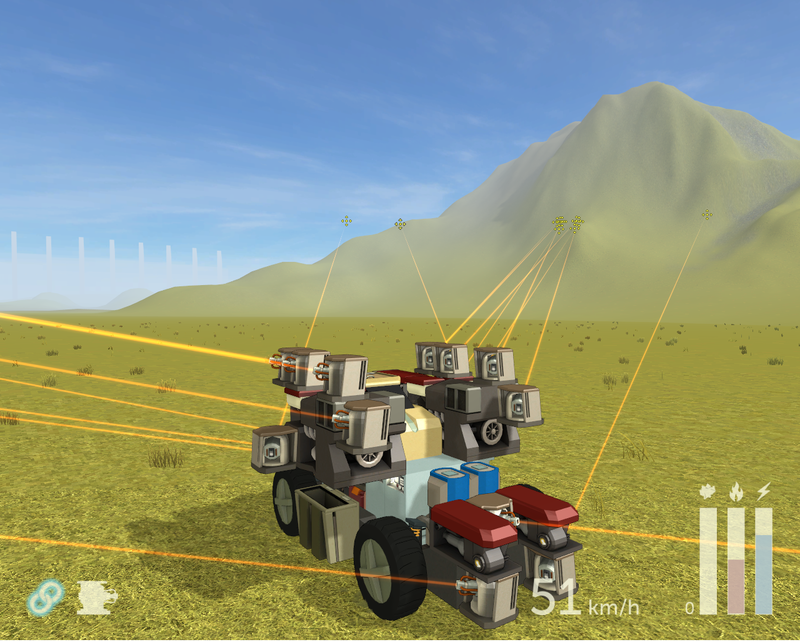 It is like fighting rovers from Kerbal Space Program. Like mounting weapons on a RC Car and rolling away. You can mount tank turrets too! I call this the „BEST”. A heavy machine with cannons, perfect for owning noobs. A bit damaged. This is named „Tepig”, after the Fire Pokemon. Laser flanker – and it actually works well against designs like my BEST – but only on open maps. After I got access to the full version, I played some single-player at first to get used to the mechanics, eventually tweaking my designs in order to make them more effective. Cool stuff: AI robots use your designs, so it takes actual skill to beat them. They also have multiple difficulties, and even the Easy one is not that easy to fight against. They will shoot you anyway when they get the occasion. I mostly used the single-player mode for grinding XP in order to build more advanced robots for the multiplayer mode. Any big vehicle can be made a lot faster by mounting some heavy engines. My „BEST” design was really slow until I got those in the full version. However, really fast vehicles are bad, since they are hard to control and can do a barrel roll really quick if they have a high center of mass. You have to balance your scrap car, since there are engine efficiency values. The building interface is really well-made, you can mount various useful (and useless if you want, but the game does not focus on that) parts in a style that reminds me of Kerbal Space Program. You can, of course, rotate every block by 90 degrees sideways in 4 directions. Big components are vulnerable, but really useful, and you can also add some armor plates to your designs, at the cost of making them heavier. You can see the shooting angle of every weapon you mount. There is also the center of mass you have to balance – the game uses realistic physics. It is not that hard to do that. The various parts you can use for your vehicle also have an HP value – they get damaged before getting destroyed. You can repair them in special areas available on every map. The multi-player mode (the core of the game): I played with a Russian and an Australian. Also, a game with the developer. All were good people, the Russian guy had a good heavy design (I guess it is better than mine, but that thing was vulnerable to my flanker) and he also knew English. The guy from Australia had a big ping value – so he was easy to beat – unless you stood in one place. The developer does have a laser design too! 😀 Overall, the multiplayer is okay – with the only major problem being the lack of players. But it can be always compensated by adding some AI ones. The developer (only one person, named Nition on the forums, from New Zealand) is actually really active, and is working on improving the game. The last weeks were full of small patches that fixed some bugs. Check it out: http://steamcommunity.com/app/350150/discussions/0/535151589889915571 – recent discussion about balance. He told me that in the future patch a fun low gravity mode will be added! There is still a lot of stuff to be implemented, but the idea of the game is even older than the Robocraft one – work on it started since late 2012. In the future a lot more stuff will be included (including tank tracks, hover/flying vehicles and omni-directional laser turrets)- so buying it now (the game is on sale too) pays a lot in the long term. -Fun gameplay, with 4 balanced weapon types, more to come in the future. That’s all. I enjoyed the game. Rating: it deserves a 9.5. Simple, fun, and never gets boring. This looks like Robocraft but less kiddy toy theme. Yep. And the idea of the game is older than Robocraft. 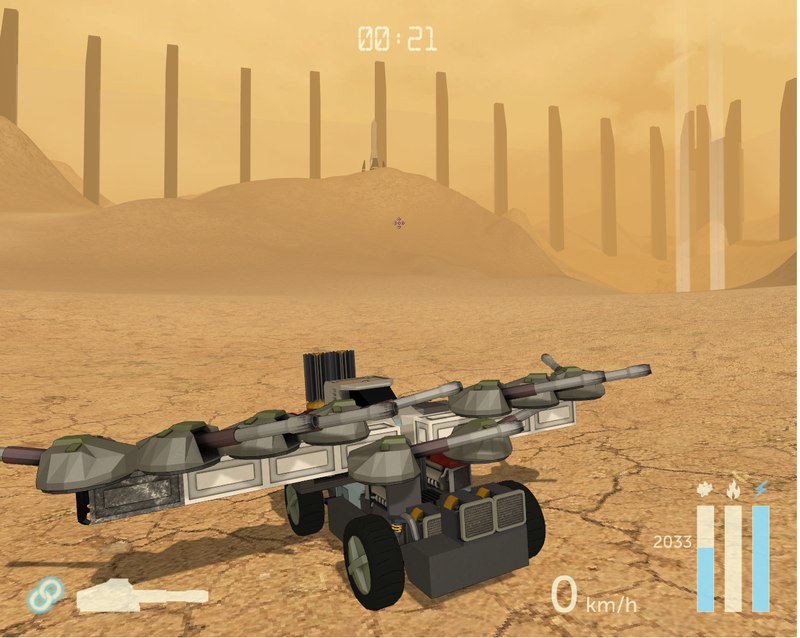 And looks mechanically more sound than Robocraft ever will. Ayyy, you should check out a game on Steam called gear up. Sort of comparable to this except it’s tanks and stuff, and it’s been around for a little while. Robotcraft is just full of space penises with guns anyway. As that’s the most “common” design. And one of the many reasons I did not stick around in that game for long.